If you are looking at the technique it means nothing. Pay attention to the energy that all great instructors exhibit. Look at both the right and left hand as well as the pulling from the center. Sagawa said many times, you cannot develop aiki power with technique alone, only with solo exercises." But, I believe that once you develop aiki, you can practice your jujutsu and aiki-jujutsu with this body. Takeda and Ueshiba never taught this, only to a few chosen people. Sagawa waited until he was 90 to teach this to a few. Throughout his life very few people ever received any of this knowledge. If we continue these ways both Aikido and Daito-ryu will no-longer have the beauty and power that once existed. It takes many years of practice and hard work to develop aiki. So, if the teacher doesn’t start it when they have time left with their students, the teacher may be gone before sharing it completely. Many quote the saying “the teacher lifts one corner, the student returns with the other three,” but if you don’t even help them find one corner, why are you teaching? 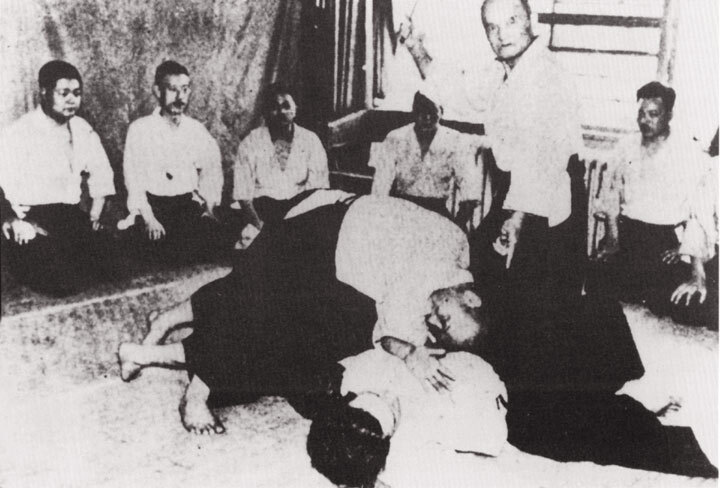 I constantly question myself asking why did Takeda and Ueshiba not teach the most important part of their art, and what was the reasoning behind it? I clearly cannot come up with a good answer. As an instructor I want my students to know what I know. And I will continue to teach the development of an aiki body.